Preheat the oven to 400 degrees. Place ears of corn in a baking dish and coat evenly with about 1 tablespoon oil. Roast about 15 minutes. Let slightly cool, then slice corn from the ear. Discard ears. In a Dutch oven to large pot, cook bacon crumbles over medium heat, stirring frequently, until crispy. Transfer to a plate lined with a paper towel. In a large bowl, whisk together corn meal, flour, salt, black pepper, smoked paprika, cayenne pepper and baking powder until combined. Mix in milk, eggs, cheddar cheese, bacon crumbles and sweet corn until combined. Add remaining oil to the Dutch oven or pot and heat to medium. Working in batches, use a cookie scoop to drop dollops of fritter batter into the oil. Fry 2-3 minutes per side, until browned and crispy on both sides and set. Remove fritters and place on a paper towel-lined plate. Repeat with remaining batter. In a small bowl, whisk together yogurt or sour cream, chives and black pepper. 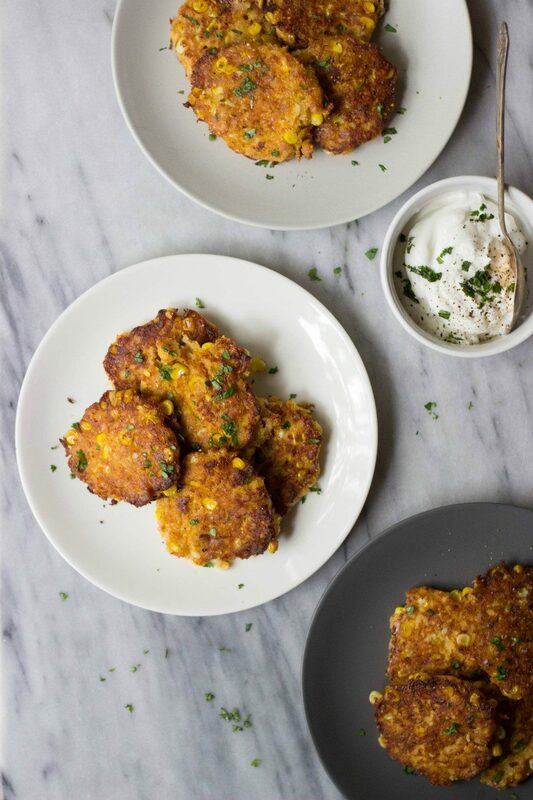 Serve with fritters.